A: Your story – with a note giving us permission to post your answer. “A Star Is Born” finished me off…. I watched the movie Cisco Pike and heard Breakdown (along way from Home). At the time I was a teen and owned two pairs of jeans, a corduroy Levi’s jacket, a pair of high top sneakers and Blitz Weinhard t-shirt. His phrasing touched me and I starting following him. Changed when I met him at a concert at the Wax Museum in Washington, DC. He was sitting at a table with a pretty singer (turned out to be a pretty famous guitarist and performer in her own right) and I acted like a fanatical fan saying words like “Kris Kristofferson, Kris Kristofferson”. He said words like “Slow down there, Hoss and sit down” which I did. He took out a shot glass and poured a liquid into the glass which turned out to be Tequila. It was my first taste and a life long memory. I first became a Kris fan in the early 1970s. I went over my friend’s house up the street from me and she always had her albums on the floor and as I walked by the albums I saw that face staring back at me on the album cover and I ran back to .see who was that beautiful man. About a week later my husband at the time said to me you remember that guy named Kris you have the hots for well he’s going to be playing at the celebrity theatre a venue that was close to us. . I literally forgot I had a car and ran up to the theatre so fast it’s a wonder my feet didn’t start smoking. of course, seeing him in concert and hearing him sing wow blew me away and everyone there. I’ve been lucky enough to meet him a couple of times and talked to him for a little bit and it was sheer heaven. And even after 45 years every time I see him I can’t wait to see him again. And that’s how it all started. In the ’70s my uncle bought Kris’ first album home and insisted I listen to it. I was a big fan ever since I was lucky enough to see him before he was mega famous at a rather small venue and that was awesome and he played some fairs in our area. My kids grew up listening to Kris and they are also big fans. My son was lucky to meet him a few times too. I see him when he comes around our area..
My introduction to Kris was very simple. I was trying to join a record club… you know 10 free records… I could find very FEW Country selections, so this one, Silver Tongued Devil & I, was listed as Country, so I ordered it. I fell in love with Loving Me Was… oh, sorry, that was Loving Her Was Easier…and has been my favorite song ever since. I loved Kris’ commercially known songs, but hadn’t checked him out any further. Went to see ASIB because I was a huge Streisand fan. Connected the name of her gorgeous and talented male co-star with the name of the songwriter of some of my most favorite songs. Brawn, beauty, and brains, all in one guy?? I was hooked. Hubby went out and found me Full Moon, and it was all over. I went out and found everything else I could. Saw him live for the first time in Seattle, WA. Was there on business, got in the room, turned on the radio (it was 1977, remember) and after the long plane ride, hopped in the shower. Came out to an ad on the radio about Kris playing at the Coliseum that weekend. I was supposed to be home and done with business by then. But I booked hotel for a few more days, changed my flight plans, let the hubby know I’d be coming home later because I was going to see Kris live! That was the first time I met him backstage, too….first of many. Been blessed to be able to go to hundreds (literally) of shows and to well known and trusted enough to get into sound checks, pre and post show meets, etc. Those were the good old days and I thank Kris for every one of them! I had just broken up with who I thought was the love of my life & I was drinking heavily & John Huston’s “Fat City” came on. KK wrote & performed the theme song “Help Me Make It Through The Night” It was just what I needed to hear. Next day I went to the music store & got my first KK recording. White CD cover, yellow signature. Essentially a greatest hits. I became completely immersed in his songs. I didn’t listen to any other Cd’s for a couple of weeks. Within a short time, I had learned the songs & was singing them myself. I became a devoted fan right then & there & I remain forever so. I was 16 years old back in 1970 when a friend of mine dropped by with the silver-tongued devil in his arm. Well, it’s 2018 and I’m still hooked on Kris. My step sister had his poster hanging on her bedroom wall when I was about 10 years old. I may have been young but I knew he was the best looking man I had ever seen. Followed him ever since. My husband proposed to me in 1974 while we were hanging out listening to the “Jesus was a Capricorn” album. We’ve been to nearly all of his concerts in Southern California and we both still love his music and have great respect for him. Not related, but several years ago while speaking with a colleague I’d known for many years, I mentioned that I was going to a Kristofferson concert. He casually mentioned that Kris was his roommate at Pomona College many years ago. I had to laugh that I’d known this guy for many years and he’d never mentioned it. A Star Is Born, seen far too young but grateful of my Mom’s poor decision making, made me a true fan! ? I was depressed and hungover and heard Sunday Morning Coming Down and I thought it takes a real poet to describe that feeling so perfectly, then started listening to other things and was blown away, Casey’s Last Ride is amazing. I was a little young to appreciate his music as he recorded it, but I first found out about him in the movies. We had just had this newfangled Cablevision installed ? in 1979 and shortly after, added HBO and Showtime. So yes, at the ripe age of 10 or 11, was able to see all the R movies a kid could want. This was around 79 or 80 and my first of his was Convoy. I LOVED that movie. I was a fan of the song from a few years before, and this movie just brought it to life. I know shortly after, I did see ASIB but at that age, I wasn’t impressed. The music wasn’t anything I had heard before (and didn’t care for) and the subject matter was a bit over my head, obviously at that age. As far as his music, I guess I eventually found out that Janis Joplin’s Bobby McGee was written by Kris, and then other songs that he had written for others that I had heard before. I don’t think I realized how talented he was until he and the others formed the Highwaymen. I remember thinking “I knew John, Willie, and Waylon, but why Kris Kristofferson? How does he fit in this equation?” I thought he was just a pretty boy from the movies who wrote a few hit songs for other people. Ha! How little I knew back then. And it was the mid-1980s and I was a teenager in love with Jon Bon Jovi so, yeah… Not a huge fan of them until I got into country music in the early 1990s. I think there was also some sort of “behind the music” special or something on TV that I saw. You know, it was hard to research things back then. Information wasn’t at our beck and call with the touch of a few buttons as it is now. I have learned much since then. And I guess it wasn’t until a few weeks ago that I realized how prolific his song catalog was until I joined this Kris Kristofferson Appreciation Group and bought his complete collection. I just wish I would have found it sooner. I found out he played near me back in May. I would have seen it if I knew better. ? Convoy made me a huge fan when I was around 4 in 1980. Still a very special movie for me until today. About 25 years later I finally discovered his music as well?and finally saw him live on stage in 2008. I was sold the first time I heard one of his songs in the early 1970s or lat ’60s. I loved “When I Loved Her” I took guitar lessons at that time and wanted to learn that song. I did learn it and I still love it. But I also learned words to all of his other songs and my future husband could play and sing those songs as well. We each had the Silver Tongued Devil Album when we married. My husband was a pilot for United Airlines and he once had Kris on a flight and he was nearly tongue-tied when he introduced himself to Kris. Kris’s daughter with Rita Coolidge was the same age as our daughter and they both went to our Pediatrician. Once when we were pulling into the Doctor’s office in Santa Monica, Kris was pulling out. I nearly came out of my skin. But I remained cool calm and collected and kept it all to myself. Loved him then and still do and so happy he finally found a life that worked for him. I became a fan in 1976 after watching A STAR is Born. He has had my heart since then. Named my baby girl after him, Kristy and almost had her on Kris’ birthday. A day late, June 23. Lol I have seen him 2 times. Once with the Highway men and a few years ago in concert. Star is Born changed my life.??? His writing struck the strongest chord for me and that has lasted to this day (45+ years) I’ve seen him many times in concert, as recently as last year. Many good singer-songwriters out there, but for me, none better than Kris. When I was a teenager my parents belonged to the Columbia records club. They sent them border lord. It was up to them to keep it or send back. They never opened it. One day I opened it and played it, I have been a fan ever since. I really love Burden of Freedom – Okay I love every song on that album. Oh yes….saw them in Rhode Island in ’78 and even though they were on the verge of the actual break up then, they were smokin’ hot together…maybe even more so because of the impending major change in their lives. The sad in those duets were 1000x more sad and it showed. This was the concert where Kris signed my charcoal sketch of him (source, Easter Island album cover) and he wrote on it: “Thanks, Emily. Someday you may know how much this means to me.” I think he was referring to his feeling, in that sad time, a spot of “gladness” that someone would sketch his likeness. I think. Then she saw what he looked like! No more criticism from her after that ?We’ve all been fans ever since. I an honestly say that Kris has been the soundtrack to my life. What a talented man!! Here’s a fun pic. 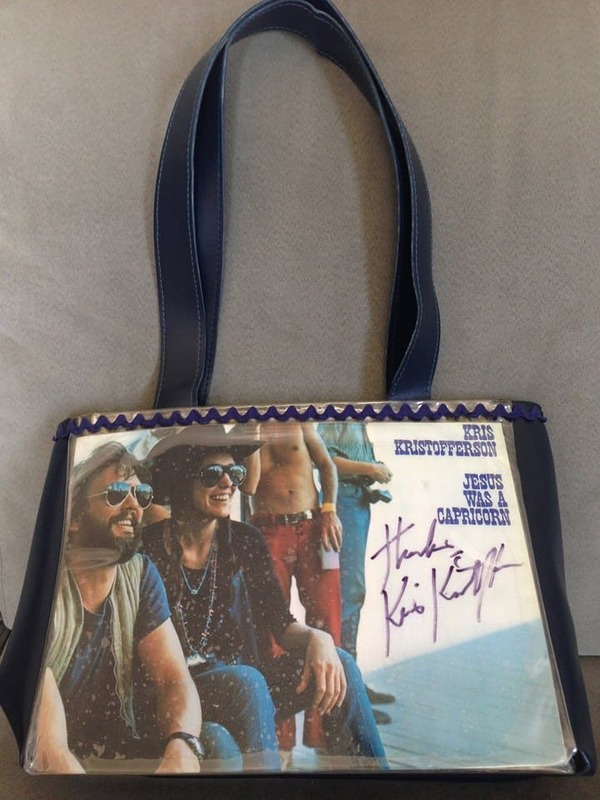 A friend made me a purse using an image copied from a Kris album. After a concert, I had him sign it. I treasure it! !